After offending the shy bladder community in November, DirecTV’s Rob Lowe commercials have now upset an organization that’s infinitely more powerful: Comcast, the cable company that will someday use humans as batteries to power its shoddy modems. 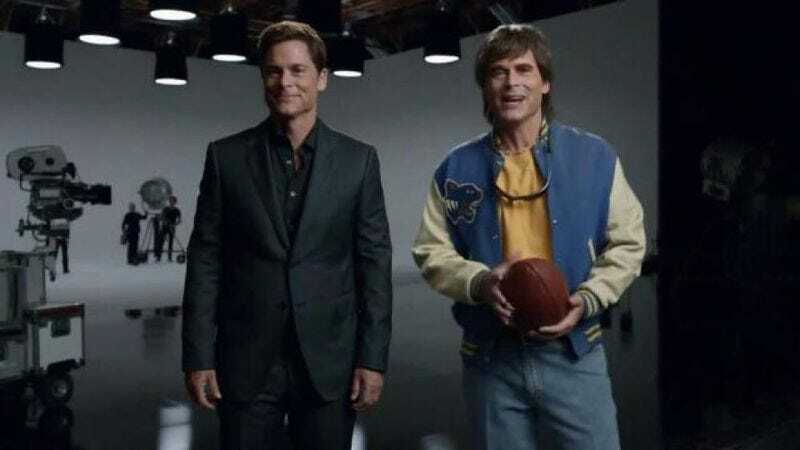 As reported by Variety, Comcast has complained to The Council Of Better Business Bureau’s National Advertising Division (or COBBBNAD), and it wants DirecTV to cancel the Rob Lowe-starring ad campaign over what it says are a series of inaccurate claims. For one, Comcast can pee whenever it wants, it just doesn’t feel like it right now. Comcast’s actual issue with the ads are about DirecTV’s assertions that its customers “get 99 percent signal reliability” and the “best picture quality and sound.” As for DirecTV’s response, it says that “the various Rob Lowe advertisements are so outlandish and exaggerated that no reasonable consumer would believe that the statements being made by the alter-ego characters are comparative or need to be substantiated.” So, following that argument, there could be a commercial where normal Rob Lowe says he has DirecTV, and then a second Rob Lowe says “And I’m Nazi Rob Lowe, and I have cable,” and everything Nazi Rob Lowe says after that would be fine. Everything. Unsurprisingly, the COBBBNAD has seen through this ridiculous premise and sided with Comcast, declaring that the DirecTV ad campaign should be discontinued. As part of its decision, the COBBBNAD said that, even though “humor can be an effective and creative way for advertisers to highlight the differences between their products and their competitor’s, humor and hyperbole do not relieve an advertiser of the obligation to support messages that their advertisements might reasonably convey.” DirecTV says it will appeal, but if that doesn’t work out, look for a new ad campaign that features normal Rob Lowe saying he has DirecTV, and then a second Rob Lowe who is different—but not worse in any way—saying he has cable. Then they’ll hug, and everyone will get Hulu Plus.